Anticipating a ban, Deborah Branting of the Back Bay has been stockpiling plastic bags. Boston joins 59 other municipalities statewide and hundreds across the nation, including Seattle and Washington, D.C., in adopting a ban. It takes effect next December, giving stores and shoppers time to prepare. Walsh’s decision ends more than a year of debate over whether to eliminate disposable shopping bags and steer businesses and consumers toward reusable ones. The goal, supporters say, is to reduce litter and cut the amount of plastic in the environment. Opponents included representatives of the paper and plastic industries as well as critics who say the measure will amount to a tax on the poor. The Retailers Association of Massachusetts also opposed the ban. “Are we disappointed? Yes. Were we surprised? No,” said Jon Hurst, the organization’s president. On Sunday, Walsh repeated his concerns about the poor but said he signed the bill because of its environmental benefits, such as reducing litter. “In theory, it’s great for the environment. There’s no question about that,” he said. The ban would encourage shoppers to use reusable bags or pay a 5 cent fee for either a thicker, compostable plastic bag or a larger paper bag with handles. Stores would collect the fees to help offset the cost of using more-expensive bags. 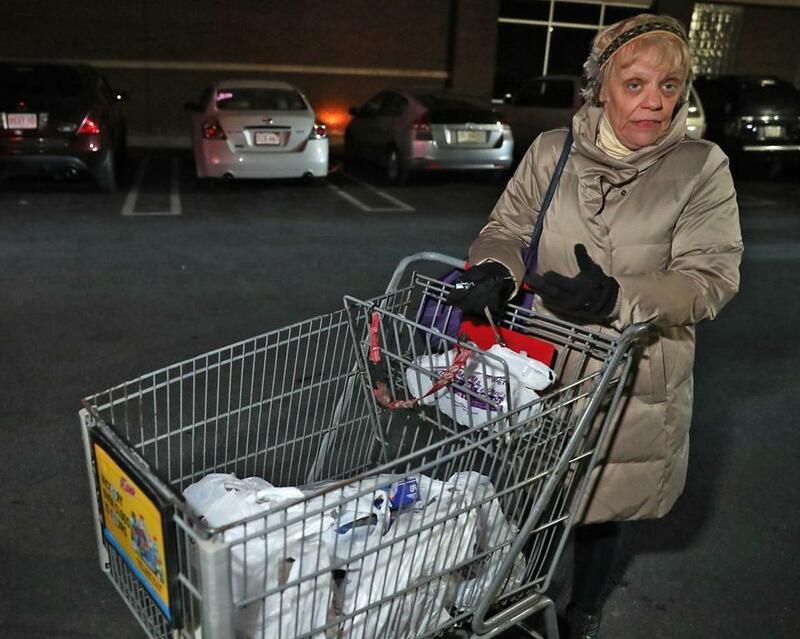 Carmen Osorio, 53, who went shopping with her family at the Stop & Shop in Dorchester’s South Bay Center Sunday, said she sometimes doesn’t have enough money to pay for groceries, and a bag fee would add to that stress. Deborah Branting, 65, of the Back Bay, said she will buy paper bags after the ban goes into effect. She already has a stockpile of plastic bags that she uses around the house. Newcombe, who was at Stop & Shop with her husband, said she supports the plastic bag ban and will begin bringing reusable bags from home. A proposal for a statewide ban is pending before the Legislature. City Council president Michelle Wu said supporters of the ban have also been concerned about its potential impact on residents and families who struggle to make ends meet. She said that over the next year, city officials will work to partner with businesses and organizations to help provide reusable bags to those with limited incomes. She said support for the ban came from residents of all income levels. “This is truly an example of a public process that considered and weighed multiple viewpoints and arrived at an outcome that will be for the long-term good for the city and residents,” Wu said. The clock had been ticking for Walsh to make a decision. The City Council unanimously approved the measure on Nov. 29, and Walsh had until Monday to sign or veto it. Had he not taken action, it would have automatically become law. Walsh said he signed the ban at 4 p.m. Friday. If Walsh had vetoed it, the veto could have been overturned with a two-thirds council vote. The body held its last meeting of its two-year term Wednesday and doesn’t meet again until Jan. 1, when a new council is sworn in, including three new members. Hard-fought lobbying on the measure continued in the days leading up to Walsh’s decision. Jack Hart, a former state senator and a lobbyist for Novolex Inc., a plastic and paper bags manufacturing and recycling company, questioned the ban’s constitutionality and urged Walsh to veto it. Environmental groups pushed for the ban. Rickie Harvey, a cofounder of the grass-roots organizations BYO Bag Boston and West Roxbury Saves Energy, praised Walsh’s decision and said in a statement that the groups’ members “now stand ready” to help implement the ban. Milton Valencia of the Globe staff and correspondent Jeremy C. Fox contributed to this report. John Hilliard can be reached at john.hilliard@globe.com. J.D. Capelouto can be reached at jd.capelouto@globe.com. Follow him on Twitter @jdcapelouto.